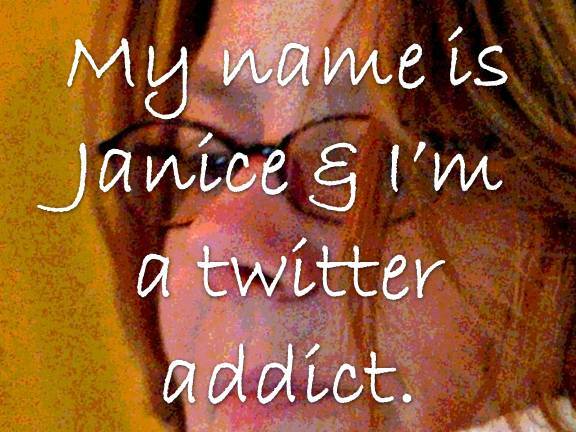 Top 10 Signs I'm Addicted to Twitter (Confessions of an Addict) - JP loves LIFE! Okay…. I know it sounds over the top to people who aren’t on twitter… but for those of us who are, there are some clear signs of addiction, obsession, etc. I have created a category in my address book for “my tweeps.” Other categories include family, college friends, work colleagues… yeah, I really did that. My blog has lots of categories, but for some reason, “my tweeps” seems to overpower the rest of the category cloud. 140 characters is A LOT OF ROOM! 120 is more like it, better <100… Gotta make RTs easy! I’m FAR easier to get along with when flying rather than driving… unless the plane doesn’t offer wireless and then I’m raging. Friends enable me by telling me what I’m missing when I have to be offline. And yes, I have offered the same assistance! Real names take some searching at times, but usernames are on the tip of my tongue! There are several others who should feel free to add the signs that they’ve seen in themselves, but I can only make it possible for them to feel welcome, I can’t make them step forward and acknowledge their own addiction. @cownutritionist here… love it! You left out the twitching that occurs when out of touch with tweeps & Twitterverse. I have a home office in my basement and go upstairs to get my coffee. On the way upstairs I take my blackberry so I can check twitter and tweet…no seriously I do!